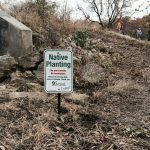 The Japanese Knotweed project at Riley Road comes to a close with planting of native grass plugs from Agrecol. Virginia wild rye, little bluestem, sideoats grama, switch grass and cord grass. 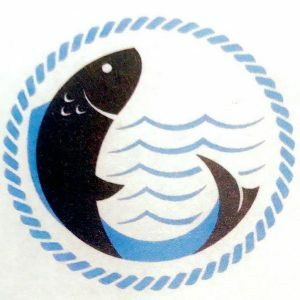 Lynne Diebel and Caroline Werner were presented the prestigious Protector Award for their many years of great efforts to protect the environment in the Badfish Creek Watershed. 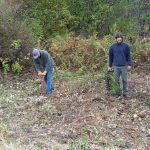 The knotweed is well on its way to being gone thanks to the vigilence of the Friend’s continued efforts in injecting and spraying. Now the challenge becomes controlling other invasive plants such as garlic mustard which are opportunistically moving in. Great weather for the workday in October! 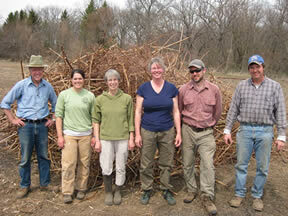 The best news was that work done in previous years paid dividends in the scarcity of plants to treat. The successful two-prong approach was continued this fall: Spray the younger plants and inject those with stems large enough to get the needle into. We cut in June 2010 at Riley Road, foliar sprayed with glyphosate in July, foliar sprayed in September with Milestone, injected in October with Milestone. Scott recommends Milestone foliar spray when leafed out in spring (May or June). Lynne will monitor the stuff and update the group by email. 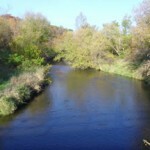 Thanks to a $3,257 Aquatic Invasive Species (AIS) grant from the Wisconsin DNR, the Friends are partnering with the River Alliance of Wisconsin and the Rock River Coalition to eradicate the invasive Japanese knotweed at the Riley Road crossing of the Badfish. Another clone was cut and hauled, and spraying/injection is planned for late September. Watch the Web site for more information. 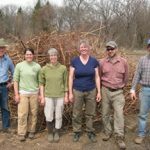 On June 13, ten valiant volunteers cut and hauled new knotweed growth to a concrete slab in the landowner’s barnyard where the cuttings will dry for later burning. 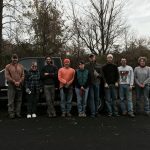 Thanks to all the great volunteers. 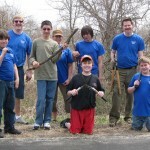 On April 18, 2009, twenty-two volunteers–from Invasive Plants Association of Wisconsin, River Alliance, Dane County Conservation League, Mad City Paddlers, Stoughton Boy Scout Troop 167, and other volunteers–worked with FBCW to cut and drag dead knotweed stalks to the landowner’s farm field where he burned them. A big THANK YOU goes out to our wonderful volunteers. 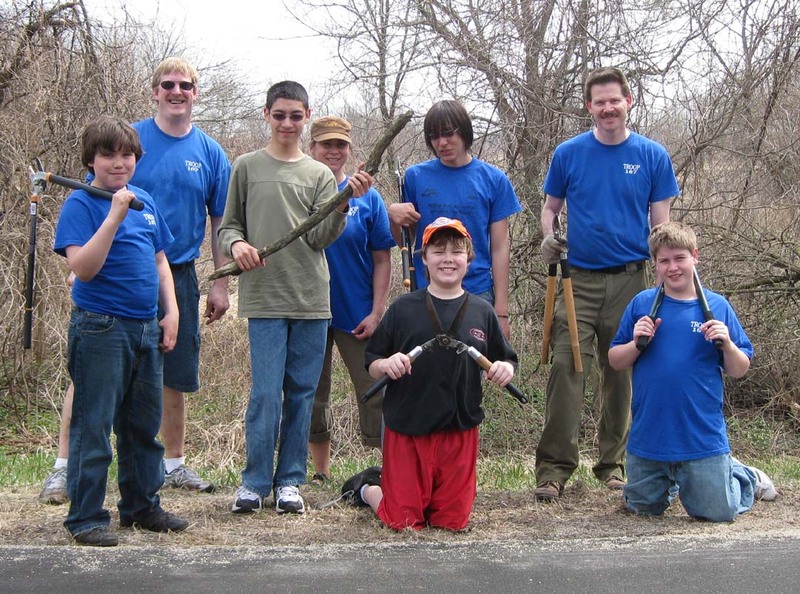 On May 9, 2009, three girl scouts, two moms and a boy scout with his little brother and mom joined three members of the FBCW Plan Committee to clean the entire culvert and creek in Oregon’s Jaycee Park. 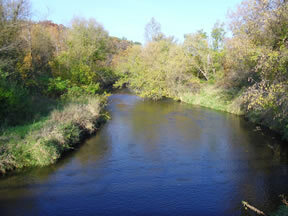 The kids enjoyed the event, the cookies, the brownies and the juice, and the highlight for the girl scouts was finding a large leech that they named Fred; with adult encouragement, Fred was returned to the culvert before they left. 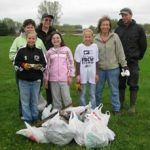 Sharon Beall also collected six bags of debris from along the railroad and the creek from the railroad overpass to Kwik Trip. 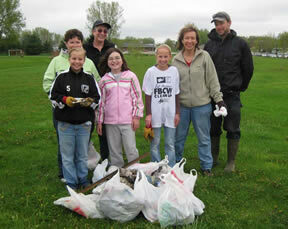 Members of the May 9th cleanup crew (including the infamous Fred the Leech) pose with a small portion of the trash they gathered. 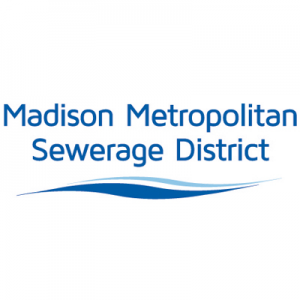 David Taylor of the Madison Metropolitan Sewerage District (MMSD) presented a brief overview of MMSD’s 50-Year Plan, focusing on potential effects on Badfish Creek, and then opened the meeting to questions.